CHENOA -- Marilyn Kauffman was delighted to see Amy Butler and Janet Quan at her door, asking if there was anything they could do to help her. Butler and Quan were two of about 40 volunteers who met Saturday morning to help their neighbors in the community of about 1,800. Kauffman and her husband have not been able to keep up on several fall chores. Her son frequently helps, but he can’t always be there, she said. Kauffman signed up for the help through her church, the Chenoa United Methodist Church. 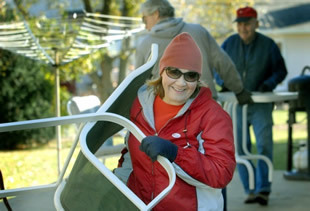 There were about 16 older homeowners and families that signed up for the Serve Your Neighbor program. The program started this year after members of the local ministerial association talked about how they could help the community. The Rev. Robb McCoy of the Methodist church said the day’s events focused mainly in raking leaves but included simple chores such as changing furnace filters. The Rev. David Heath of River of Life Outreach is excited about the potential for the program. “This may be our first year for this, but it certainly is not going to be our last,” Heath said. Quan said she got involved as a volunteer because she and her husband have been before the Chenoa City Council many times to push for the cleanup of abandoned or derelict properties. “This is just an outgrowth of our efforts to help keep up the city,” Quan said. For Butler, the day of volunteering was a nice way to help out neighbors but also to spend time with family, including her grandson, Jakob, 8, who also volunteered. “It’s been fun helping people out,” Jakob Butler said as he took a break in raking. His mom and dad were nearby loading raked leaves into a trailer used to haul the leaves away. (Reprinted with permission from the Nov. 7 issue of the Bloomington Pantagraph).